Timber look aluminium screens and cladding from Covet International were specified for a beautiful luxury residence situated along Sydney's Northern Beaches. Designed as the perfect private retreat by Koichi Takada Architects., the Sydney property features a minimalist Japanese vibe. Sandstone walls, timber look screening and floor to ceiling glass walls and windows create an open space, connected to its natural surrounds. For the privacy of the residents, floating timber-look screens have been installed along the length of the property, creating a private and secluded retreat from the neighbours. Given the beachside location of the property, the architects chose durable timber look aluminium Ever Art Wood for the screens, with 30x85 profile battens mounted to 100x100 posts in Kuri-Masame. Timber look 12x100 Ever Art Wood planks have been used for the garage door. 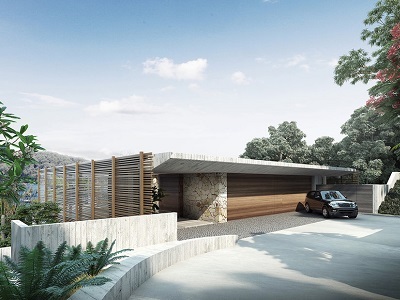 Products specified for the Sydney residence include Ever Art Wood Kabebari 30x85 concealed fix battens mounted to Koshi standard hollow sections in a 100x100 profile; Ever Art Wood Kabebari planks 12x100 mounted to the garage door; Kuri-Masame battens; and textured battens and planks. All Ever Art Wood products perform well when tested to AS/NZ 1530.3 (spread of flame/ index 0) and AS/NZ 3837-1998 (result/ Group 1).